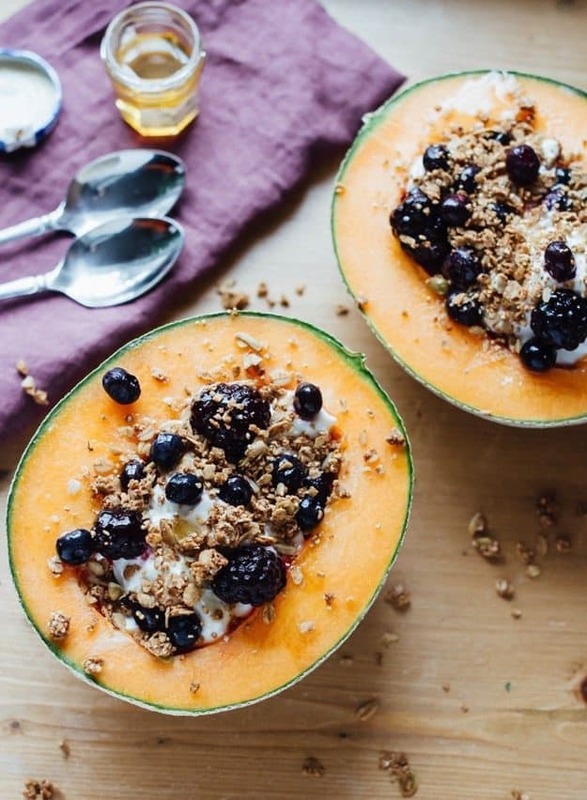 Healthy cantaloupe breakfast bowls filled with yogurt, granola, berries and a drizzle of honey. They’re loaded with protein to keep you feeling full all morning! Happy Monday friends! Before I get into the details about these breakfast bowls I have a few things to tell you about. I’m going to do a list, just to make it easy. Happy belated Mother’s Day to all my mamas out there! I hope your day was perfect. I didn’t get to see my mom, but we hung out with Isaac’s mom who lives here in Richmond. Isaac took her to The Veil Brewing Co. to get her nails done because they had nail artists there for the day. And then the whole fam went to dinner at Lehja, our favorite Indian restaurant. It was lovely. Upon waking up this morning I watched through the Mother’s Day feed on Snapchat and it made me feel so warm and happy inside (kind of like the new iphone commercial). So much mom-love. My next 28 Day Transformation Program starts in one week!!! I’ve been hearing from so many people who feel like they need a reset before summer begins. If this sounds like you, definitely check out the program. It’s not about dieting or restricting. It’s about setting goals, embracing healthy habits and eating food that nourishes and fuels your body. See all the details and sign up here. Have you heard about the Food Entrepreneur Summit yet? It’s a (virtual) event where I’ll be speaking, along with 20+ other entrepreneurs and bloggers. There are so many AMAZING sessions on the docket about creating content, editorial calendars, making money through blogging, affiliates, getting out of the comparison trap and so much more. I don’t share much about the business side of blogging and health coaching here on EBF, but it’s something I get asked about all the time so I’m happy to be hosting a session on leveraging your local community. If this seems of interest at all, you can get more info about the summit, see all the speakers and learn how to sign up here. Alright, with all those announcements out of the way, let’s talk cantaloupe and yogurt. I go through phases with breakfast and lately I’ve been on a major Greek yogurt breakfast bowl kick. I usually just portion some yogurt in a bowl, top it with whatever toppings I’m in the mood for and dive in! 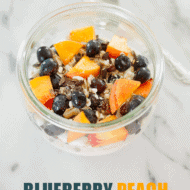 It’s super quick, requires no cooking and keeps me full all morning. Plus, it’s a good reason to eat granola. I’m all about it. Last week while I was making my standard bowl with berries and granola I got the bright idea to chop up a cantaloupe we had sitting on the counter. I has all intentions of chopping it into chunks and putting little bite-size bits into the yogurt, but once I cut it in half and took out the seeds, I figured I could just use it as a bowl. 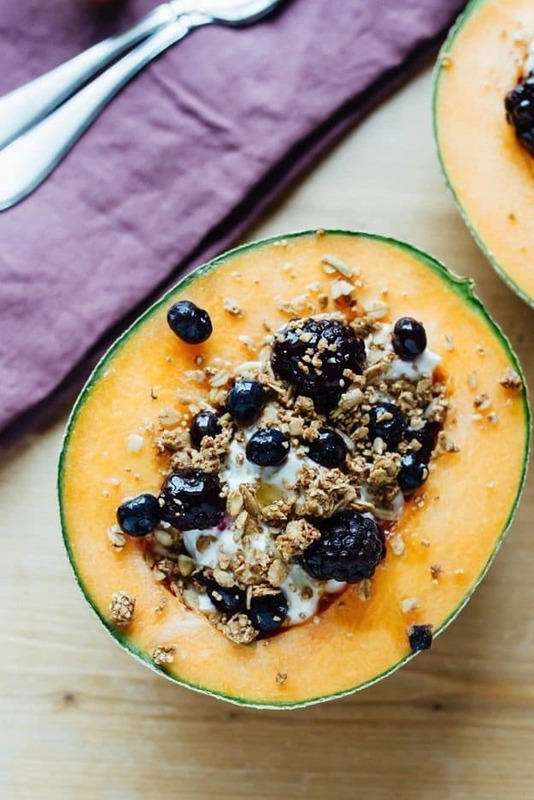 And thus, this little recipe for cantaloupe breakfast bowls was born. 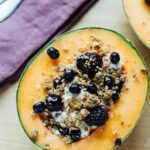 Just like with regular yogurt bowls, these cantaloupe bowls are super simple. They just require one extra step (chopping of the ‘loupe) and they’re a little less portable — but they make up for it with fanciness. I’m kind of obsessed. For the ingredients, I’ve been hooked on Fage 2% Plain Greek yogurt or siggi’s, Purely Elizabeth’s Blueberry Hemp Granola (my fav store-bought granola) and Trader Joe’s frozen Very Cherry Berry Blend. Feel free to use whatever you have on hand. If you’re really ambitious and want to go the homemade route you could make a batch of my grain-free granola because it’s amazing. 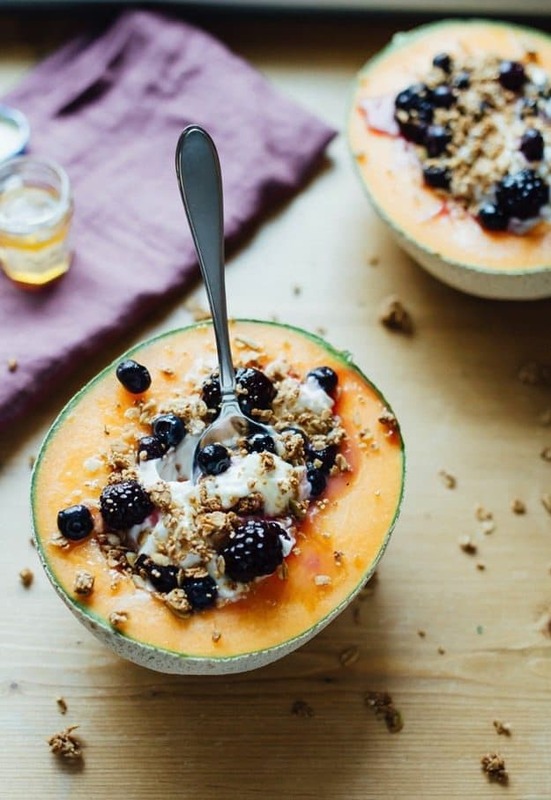 Healthy cantaloupe breakfast bowls filled with yogurt, granola, berries and a drizzle of honey. They’re loaded with protein to keep you full all morning! Cut cantaloupe in half and scoop out seeds. Portion about 1 cup of yogurt into each cantaloupe half. Top with berries, granola and honey. Serve. These would be so impressive for a brunch too! 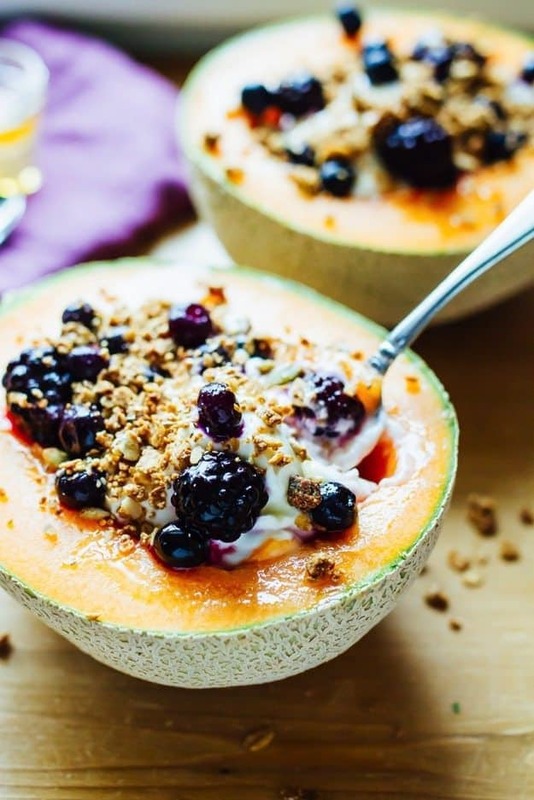 I have a whole cantaloupe in the fridge, just WAITING to be made into this recipe!! Perfect breakfast bowls! What a great idea! Those bowls are beautiful! I love the idea of filling them with yogurt and granola. This is so inspiring me to head back to the store for cantaloupe. I need to look for that hemp granola too. I always want to eat more hemp, but forget to do anything with it. Then next thing I know the bag has been open for too long and goes to waste. Pinning this recipe! I just love these bowls. A delight to look at and so healthy. Perfect for a family brunch or a treat for myself. Great idea. 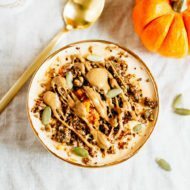 I am loving these granola yogurt bowls! They look like the perfect after school snack for my kids too! And headed to check out the food conference info now–sounds great! Now this is my kinda breakfast! I’m ALL about the fruit bowls! Looks ah-maz-ing!!!! Thank you Catherine. 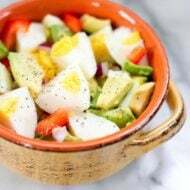 I hope you get a chance to try the cantaloupe bowls. I so so LOVE this idea! What a lovely presentation – and, can’t beat a no-rinse “bow” eh?! I love the idea of using it as a bowl! So excited for the summit! You shared SO many great tips on connecting with your community! What a fun way to serve fruit and yogurt!